Preheat oven oven 425 degrees. Chop bacon and cook it until crispy. If using pork bacon, drain it on paper towels. 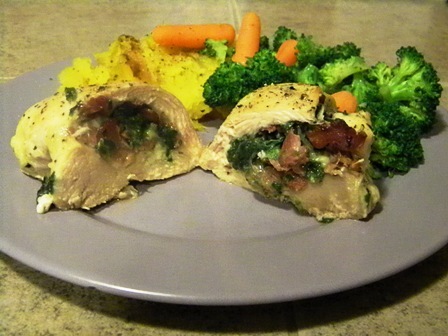 Cut about a two and half inch hole in the thick part of the chicken breast to form a pocket. It should be an inch or two deep, just make sure it does not go through the other side. Stir bacon, spinach, and cheese together in a bowl. Stuff spinach mixture into the chicken. Sprinkle outside of chicken with salt and pepper. Place in a glass baking dish and bake for 20 – 25 minutes. a simple and wholesome meal that is easy to prepare. brilliant when i have to cook after a day at work!